Creating color schemes from photos is one way in which fiber and textile artists find inspiration for their work. Kris's Color Stripes blog is a wonderful example of color palettes that can be obtained from photos. 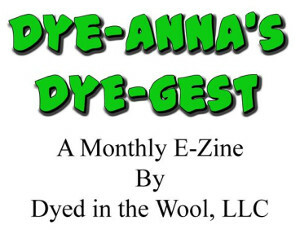 What I've been wondering however, is how to duplicate the colors from my own palettes onto fibers, fabrics, and yarns. I've been thinking that there must be a way to create dye formulae to match colors from a photo. After a lot of poking around on the internet, I've come up with an idea which I plan to try soon. Here it is in a nutshell. 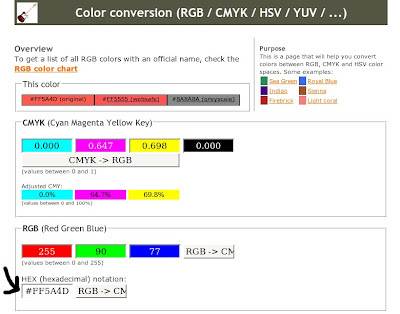 Computers use what is known as hexadecimal codes to interpret color. These are based on the RGB (red, green, blue) color model which is the same model used to mix colored lights. Why RGB instead of the traditional artists' RYB (red, yellow, blue)? Because devices like digital cameras, scanners, and computers interpret colors like lights rather than paints. Hexidecimal (or hex) codes use values from 0 to 9 or A to F and look like this: #40E0D0 or #EE82EE. The first two places refer to red, the middle two to green, and the last two to blue values. A hash mark always precedes them. By changing the codes, a web designer can determine the colors for background, text, links, etc on a web page. Several websites have charts of these codes, such as this one at december.com, or this one at web.forret.com. Obviously dyes don't work like lights, so potential recipes would have to be interpreted in a different model. For my experiments, I'm going to try the CMYK (cyan, magenta, yellow, key or black) model. Why? Well for one thing, according to my experiments, dyes don't mix like paints do. For another, it's easier to convert hex codes to CMYK codes rather than RYB codes. Most photo editing software can pick out individual colors and give you the hex code. Many of them (like The GIMP) can give you the CMYK code too. But you don't need your own editing software to pick colors from your own photos. There are many online editors that can do it for you. I found the one below at LunaPic. I had the choice of either using their free photo, or uploading my own. Wherever I click on the photo, the color picker isolates that color and displays it at the top, along with it's hex code. Next, I need to convert the hex code to a CMYK code. This can be done Peter Forret's online Color Converter. I type in the hex code at the bottom and click the RGB -> CM.... button. At the top, the color displays as several swatches. Under that, the CMYK and RGB codes are given. My theory is that by substituting fuchsia for magenta, and turquoise for cyan, those CMYK values should give me proportions for my dye recipe. But how to test? With Olli Niemitalo's free, online Dye Mixer Applet (which is also available for downloading). There is a column on the left side of the dye mixer applet entitled "Dye." If I click on any "blank," I get a drop down menu with a number of different types of dyes and colors to choose from, including several Procion MX dyes. The choices are somewhat limited, but hopefully I can get an idea of whether or not I am on track. 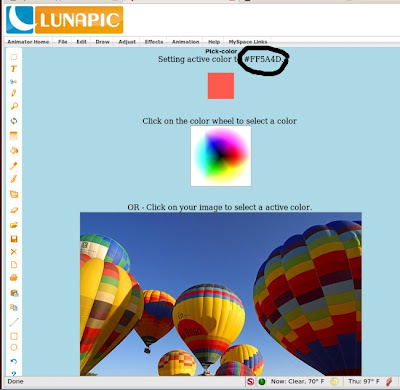 A color swatch for each individual color is displayed at the right. The "Mix Amount" column in the center lets me adjust dye amounts with either a slider, or by plugging in actual values. 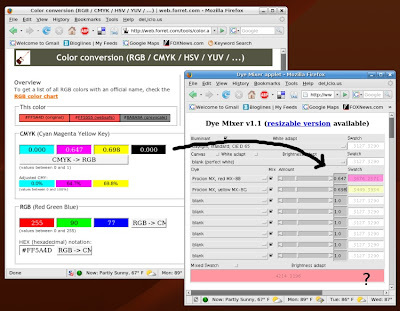 I input the CMYK values from the Color Converter. At the bottom of the applet, I can see the mixed swatch. How well does the mixed swatch match the original chip from LunaPic? It's not exact. There might be several reasons for this. One thing I notice is that the color swatches on the right for the individual dyes display lighter hues than the CMYK key on the color converter. I can note too, that my mixed swatch on the applet, appears to be a lighter hue than the original color I'm trying to match. Another problem is the dye color choices available in the dye mixer applet. There are two reds and four yellows to choose from, and none of them matches the CYMK key. However! The mixed swatch is enough in the ball park that I am encouraged to take this a step further and try some dye experiments. Looks like I've got my work cut out for me, doesn't it? What nifty software you're using! And a very unique fix to color translation issues. I am very curious to see how the differences between your CYMK swatches vs. the dye mixing applet translate out to real life. If it';s even somewhat ballpark that should give you a lot more control and predictability in your recipes. It never occurred to me to go this route to duplicating color. I can't wait to see what you come up with. I admire your patience in fiddling about with the computer like that - I usually loose it quickly, that's why I tend not to use it for colours, designing etc:(( I have had similar problems with mixing dyes though - I usually take gaywools - and the results are totally unpredictable, because all of their dyes are mixes. fine, when you take one dye and use it alone, but mixing is hit or miss! I think this looks so fun I haven't tried dyes yet but I just love all of you information. What fun!! I'm resting right now because of a few health issues so I'll have a lot of time to play around. Thanks for sharing. I am very interested to see how this turns out. Of course it will vary from fiber to fiber, since the same color mix will take to cotton, silk, or wool in different ways. When I was in college we did triaxial color wheels on all 3 fibers. It was really fascinating how the different colors mixed together and how they worked on different fiber types. I've purchased dyes from Judith MacKenzie which she sells in the CMYK (cyan, magenta, yellow, key or black) printers colors. I have a book for printers and color separation that I use when I work with her colors, but I have to tell you that the mental switch-over causes creative constipation. I need painters colors to feel relaxed and go with the flow. It's the old dog, new tricks thing. Leigh, what a great piece! And what you are discovering and will continue to discover is that those computer numbers will give you a place to begin. Whether you use MX or acid dyes, the so called "pure" dye colors are never going to be the same as the computer pure colors. A red, for example, is always going to lean at least a tad to either blue or yellow. With MX dyes, there are enough basic primary colors that you can chose two of each primary color, one leaning towards one side of the color wheel,the other leaning towards the other side. Depending on how you choose your colors, you can thus create more or less brilliant secondary colors. But then you get into shades and tints and subtle combinations. And, for me at least, all these subtle combinations are where the fun really lies. So, do start with the proportions suggested by the computer charts and prepare for a most fascinating ride! Leigh, as usual, you astound me with your ability to ferret out great info when you're pursuing an interest. Great resources! Your colors can and will be influenced by your monitor's settings as well as by your printer's settings. So what you see may not be what you get. That's another problem when translating between digital and real life. However, once you calibrate for your own devices with what end products you get, then you should be able to get pretty consistent results. I should have known that while I was away, you'd be doing some type of alchemy! Thank you all for such encouraging comments. Peg and Jane, I pondered the color monitor factor as I wrote this post. What I've decided is, to start with "real" photos for my experiments. I'll scan them into the computer, choose some colors and codes to start, calculate a starting recipe, and then go from there! I've already got a sketchbook to record all my experiments. And of course, you'll be the first to know how they're working out! Lavendersheep, that's a good point about the different fibers. I'm making a mental note to later repeat my experiments with acid dyes on wool at least, but more later.